This is an essay re-posted from my blog, Song of the Lark, where I've been covering and dissecting the Minnesota Orchestra lockout since late August. To understand how I've come to such an impassioned pro-musician point of view, please read some of the dozens of essays I've written about the situation, and learn about how thoroughly and consistently we audience members have been disrespected and alienated during this hellish lockout. We have been told by orchestra management in no uncertain terms that if we do not have money, our opinions about the direction of the organization do not matter. And even if we do have money, but have reservations about management's Grand Plan - or are Judy Dayton, the orchestra's single most generous patron, and a staunch musician supporter - we are completely ignored. Our emails go unanswered. Our letters are apparently shredded. Our Facebook posts are promptly deleted. Petitions with thousands of signatures aren't even acknowledged. It is in the face of this disgusting disrespect shown to me and my fellow patrons that I write with the attitude I do here. If someone on the Minnesota Orchestra board of directors decides to seek public input, maybe I'll soften my judgments. Once upon a time, Minneapolis had an orchestra, and it was recognized as one of the greatest in the world. On the strength of its artistry, $100 million were raised to support it in the depths of the Great Recession. Half of that money went to support new artistic initiatives and the endowment, now the fourth largest in America...larger than New York’s and Los Angeles’s. The rest went to a huge new lobby of glass and stone, currently nearing completion on the south end of Nicollet Mall. It will be finished by early July. But there will be no orchestra to open Orchestra Hall. Last October, three men – two banking executives on the Minnesota Orchestral Association board of directors and one spectacularly inept orchestra manager from Bournemouth – slipped the Minnesota Orchestra a potent sleeping potion in the form of a lockout. The MOA has not presented an orchestral concert since late July, and they will not be presenting any this July, either. Even after seven months of not paying musicians’ salaries or benefits, they claim they don’t have the money to present concerts...and it’s simply too expensive to play and talk, CEO Michael Henson explains. Mr. Henson continues to receive around $400,000 a year in compensation, the orchestra manager who doesn’t actually manage an orchestra. He makes a perplexing bedraggled picture, pleading poverty while wearing a yellow vest and hard hat and showing off his fifty million dollar lobby. The state of Minnesota is currently investigating the MOA’s finances. Things in Minneapolis have gotten so bad that a quarter of the orchestra’s seats are empty, with more musicians departing every month. There is no end in sight. Every eight weeks or so, the musicians of the Minnesota Orchestra cook up a short-lived antidote to the potion: they put on a concert of their own. With the help of two of their former music directors, as well as their current conductor, Osmo Vänskä, this season the musicians have put on extraordinary performances of Dvorák, Shostakovich, Bach, Beethoven, and Sibelius. A few weeks ago they announced a late April concert: a program of Mozart and Bruckner, to be conducted by their former music director, eighty-nine-year-old Stanislaw Skrowaczewski. The soloist in the Mozart clarinet concerto would be principal Burt Hara, one of the great orchestral musicians in the world. As always, the tickets sold fast. Of course lockout concerts would mean nothing without a passionately engaged audience, and I’m proud to say that the Minnesota Orchestra has the most devoted audience in America...maybe in the world. Behind the first violins stood a eight-foot-tall tower of flowers. I’ve never seen a more beautiful arrangement. Their color and fragrance were all the more beautiful after our long – both literal and metaphorical – winter. They’d been sent with love by a translator from Japan, who has loved the musicians of the Minnesota Orchestra for many years, but who could never bring herself to write to tell them so until the lockout began. Their recordings helped her pull through terrifying health scares and the devastating earthquake of two years ago. Eriko couldn’t be in Minnesota in person, but her pillar of flowers stood like an angel sentry on the corner of the stage. At the time of the concert, she was across the world in Japan, meditating. After intermission, as has become tradition, violist Sam Bergman stepped up to the edge of the stage. By now the whole locked out audience knows what that means: a barnburner of a speech is at hand. And although all of Sam’s speeches have been extraordinary, this one was especially so...and the audience’s impassioned reactions said as much as Mr. Bergman. In this context, Bruckner suddenly meant something. (In this context, anything means something.) As fate would have it, almost a year ago to the day, I’d written a rather...controversial blog entry called “I Hate Bruckner, Part I.” Clearly Fate has a sense of irony that puts Stephen Colbert to shame. You say you hate Bruckner?, Fate says. Well, then, how about for your first live Bruckner experience, I snag you a legendary Bruckner conductor, sprinkle dozens of friends onstage and in the audience, and top it all off with the orchestra The New Yorker has labeled the greatest in the world. That’ll be a good introduction to Bruckner. Oh, and also, by the way, said orchestra is facing imminent dismemberment, if not outright dissolution. So enjoy! At the first solemn horn call of Bruckner 4, my horizons began to broaden, and the appeal of the music slowly dawned. Time and space simply – disappeared. At every repetition of every phrase, the musicians clawed at every note as if their very careers depended on it...and maybe they did. The seats rumbled with each massive fanfare. As time drifted on I was unsure if we had been in the hall an hour...or twenty-four hours...or twenty-four years. We fell into a collective trance. How long had the lockout gone on? Was there even a lockout? Surely not... All two thousand of us were swept away in the music and looking out over a cliff together – out at an ocean, perhaps. Or maybe we were on the top of a mountain, landscape spread far to the horizon. But as Sam had said, we were together...and surely, to be all together in our dark night in that dark hall...surely that means something? For as long as this lasts, we won’t be alone. Giant chords shifted beneath our feet and resolved in strange and glorious ways. A strange irrational peace descended upon me, the kind that comes when I recite well-worn phrases from my wrinkled Book of Common Prayer. Stan raised his arms, a prophet in the bright stage lights. Suddenly the past and future meant nothing; there was only the power of the present. This is transcendence. The integrity of Stan – the generosity of Eriko – the eloquence of Sam – the passion of Burt – the courage of the Minnesota Orchestra musicians to sacrifice their very livelihoods in an attempt to preserve their beloved institution from decimation – the buzzing energy of the agitated Minneapolis music scene – and most of all, the untrammeled power of live orchestral music. You would be unwise to bet against.any of these things, let alone all of them at once. They may be under fierce assault, but I swear to God that Minnesota will not rest until all those things are celebrated as they deserve to be. Silence may win in the short term. But in the end, you will not deny the power of this music, nor the power and professionalism of these musicians. Our story is not over yet. This city will keep fighting until the very bitter end to find our musical happily ever after...no matter how many barriers the management of the Minnesota Orchestra sees fit to put in our way in the meantime. How many musicians have left the orchestra because of the lockout or the lead-up to it. Excellent blog entry. It seems as though the lovers of music are with the musicians, without whom there would be no music. I, for one, wish them all, musicians and audience the best. Great post Emily! I enjoy your writing and appreciate your humor. Could you share with us your thoughts for a another model for orchestras where the musicians were not just employees that are so separate from management. Elsewhere on v.com people have said that musician-run orchestras don't work very well, but I wonder why that is. From your concert review, it seems a musician-run orchestra where a fundraiser department and maybe even an orchestra manager are either on equal footing with the musicians, or reports to them might be successful. There would have to be a board that the musicians reported to of course. I'd be interested to hear your thoughts. Beautifully written and very moving, Emily. Thank you. With regards to management - I think some of our orchestras in England are run by the players themselves. Not sure - maybe someone can enlighten us? So far as I'm aware, all four of the Symphonies in London are self-governing. I heard on the morning's news that Vanska has given management an ultimatum: Give me my musicians back or I'm outta here. I just don't understand this situation. 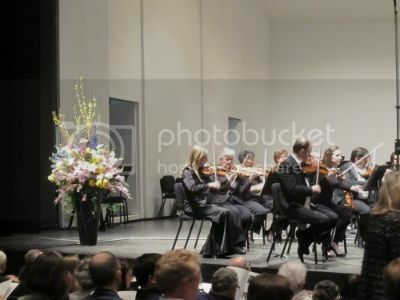 One would hope that the purpose of the board is to support the orchestra, to hire responsible management, and to engage in fund-raising sufficient for the orchestra's needs. Assuming all non-musician parties are acting out of self-interest, as humans are wont to do, what's the endgame? What are they getting out of this, other than a reputation as the sons of pond scum that took down one of the world's great orchestras? Is there some sort of glory in that? Emily, I have missed your blogs on violinist.com. Glad to have you back. Bruce that Star Trib article says that the clarinetist got an audition, not a job. Did I misread? Paul, he won the audition, not a chance to audition. Okay I see. You said "won the audition" where I inferred "won an audition."